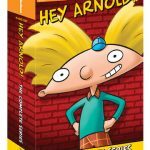 Synopsis: A favorite with viewers and critics alike, Hey Arnold! stars Arnold, a fourth grader who lives with his grandparents Phil and Gertrude, owners of the Sunset Arms boarding house. Each episode finds Arnold in a new, sticky situation, whether it’s helping out a schoolmate with their problems or dealing with his own. 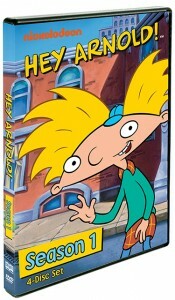 Unfortunately, Arnold’s predicaments are often started by Helga, a schoolmate who picks on Arnold and constantly bullies him. However, Helga only pretends to dislike Arnold to hide the fact that she is secretly in love with him! Nickelodeon came out with some fantastic animated shows in the 1990’s. Prior to that, a lot of the tv cartoons were starting to look the same. 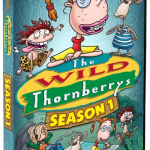 Nickelodeon came out with a bunch of them that are each unique in their own way, but also distinctly in the Nickelodeon style. I can remember watching Hey Arnold! with my kids back in the day. At first I wondered why my kids were so entertained by this kid with the football shaped head. But then I watched it with them, and it all made sense. The characters are human, but not quite real. We can laugh and learn along with them, but it’s all in fun. It doesn’t have the serious feel that more realistic characters would. 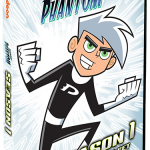 It was fun for my family to watch Season 1. I remembered the basics about the characters, but didn’t remember any specific episodes even though I’m sure I saw most of them when they were originally on TV. My teenagers, on the other hand, did remember specifics from Season 1 and the other seasons. Hey Arnold! is a classic that will bring back memories for teens and adults. New fans will have fun getting to know Arnold, his grandparents and friends. HOW TO CONNECT – You can like Shout Factory on Facebook and follow them on Twitter. Disclaimer/Disclosure: Review sample provided to me.